Wow Talk about shock and awe!!! 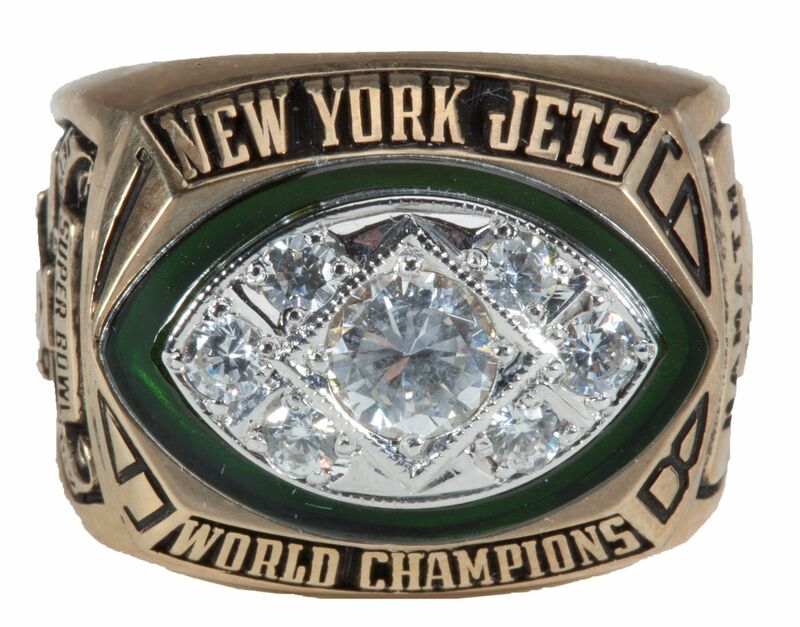 The Jets 16-7 win over the Baltimore Colts in Super Bowl III was one of those events that defined an era. Everyone has spoken of the great accomplishment, the AFL arriving on the big stage but so few people talk about the vanquished 15-1 Baltimore Colts and Don Shula. 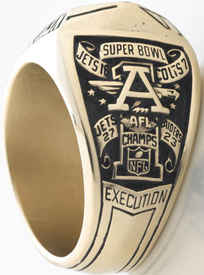 The loss was so devastating and embarrassing that the NFL didn’t issue a championship ring. 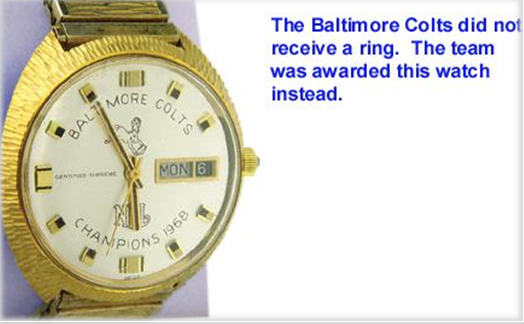 A team that was 3hrs away from being the greatest team in NFL history received THIS WATCH when they failed to win the game…wow! Think the NFL thought highly of their championship season? Now before you ask, the answer is yes the teams that lost Super Bowls I, II, and IV did receive rings. Let’s take you back to 1968…The Colts were motivated to win it all in 1968 because in 1967 they had the BEST record ever to NOT make the playoffs:11-1-2 including a win over the Packers who would go on to win Super Bowl II. The Rams had an identical record and won the tiebreaker for giving the Colts their one loss. The Colts were in the Western Conference and for the better part of the 60’s couldn’t unseat the Packers. Except in 1964 when Paul Hornung was suspended for gambling, yet the Colts were upset in Cleveland in the Championship game. Yes you heard me correctly…the Packers and Colts were in the WESTERN CONFERENCE back then. So Vince Lombardi steps down and the Packers run out of steam and the Colts go 13-1 in 1968. So in TWO seasons they had only lost 2 games going 24-2-2. No regular season overtime back then hence the two ties. Like other teams I’ve mentioned, this team that DIDNT win it all was the strongest Baltimore Colts team ever. They had a defense that set the league record for fewest points allowed in a 14 game season with 144 points. They held 11 of their 14 opponents to 10 pts or less including 3 shutouts. The great Johnny Unitas got hurt and Earl Morrall replaced him and became league MVP at quarterback. They had Tom Matte and Jerry Hill as arguably the best running tandem in football. Their only regular season loss in 1968 was to the Cleveland Browns who they would go on to blow out 34-0 in the NFL Championship game IN CLEVELAND. So with that it was as though they practically had an undefeated season and were lauded as the best team in NFL history. Would all of this have happened had the Colts WON Super Bowl III? Epilogue: Although the Colts would go on to win Super Bowl V, how redemptive was it? One of the great things about the NFL and its history are the stories behind the men. Unfortunately the greatest lessons come from those that come up short in big games. Everyone loves a David v. Goliath scenario when the underdog pulls off an upset. When a landmark incident takes place like Super Bowl III, all eyes follow the winner who have vanquished a favored foe and the game is revered and talked about for years to come. Super Bowl III has been rehashed, talked about, re-shown, and re-released in 1997 (as a video broadcast) for a generation to see for themselves a landmark game that changed the course of the NFL. It validated the AFL , its history, along with legitimizing the merger between the two leagues. It was the centerpiece to a Hall of Fame career for Joe Namath and allowed Weeb Ewbank to become the only coach to win a championship in both leagues. Yet what does all this fallout do to the men who lost that event?? Is the harm irreparable for the men who came up short in Super Bowl III?? How easy is it to forget and move on?? Surely the Baltimore Colts could go on and win another championship and set things straight, right?? Here are the accounts of Bill Curry, Mike Curtis, and the late Bubba Smith. As you listen to the recount through their eyes, you will get a different feeling about Super Bowl III than ever before. 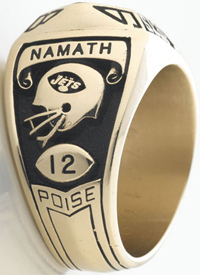 Copy of Joe Namath’s Super Bowl III ring. What is ironic, these are interviews celebrating their Super Bowl V championship for the America’s Game series. What makes these poignant is the honesty reflected in their voices. What makes these stories resonate is this was a game 45 years ago and made even more impactful is this was the last interview for Bubba Smith to talk about this with his passing away in August 2011. 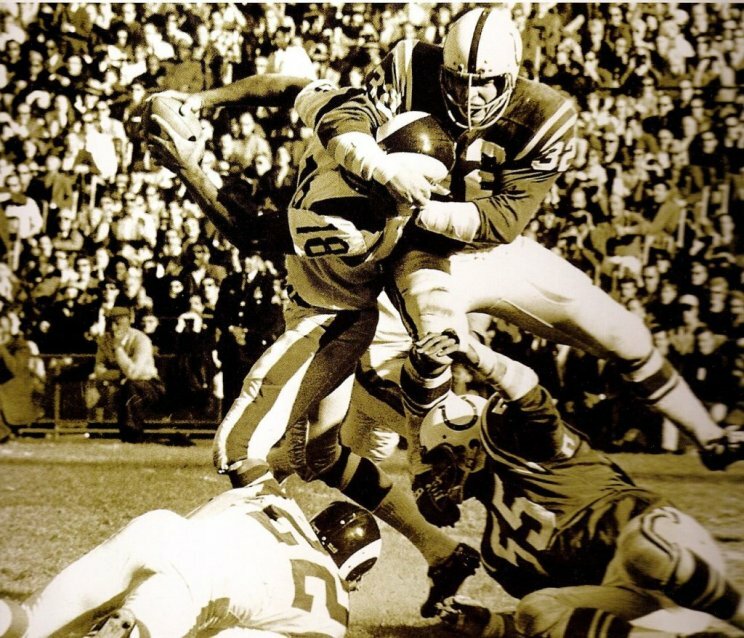 The Jets 16-7 win over the Baltimore Colts in Super Bowl III was one of those events that defined an era. Everyone has spoken of the great accomplishment, the AFL arriving on the big stage but so few people talk about the vanquished 15-1 Baltimore Colts and Don Shula. The loss was so devastating and embarrassing that the NFL didn’t issue a championship ring. 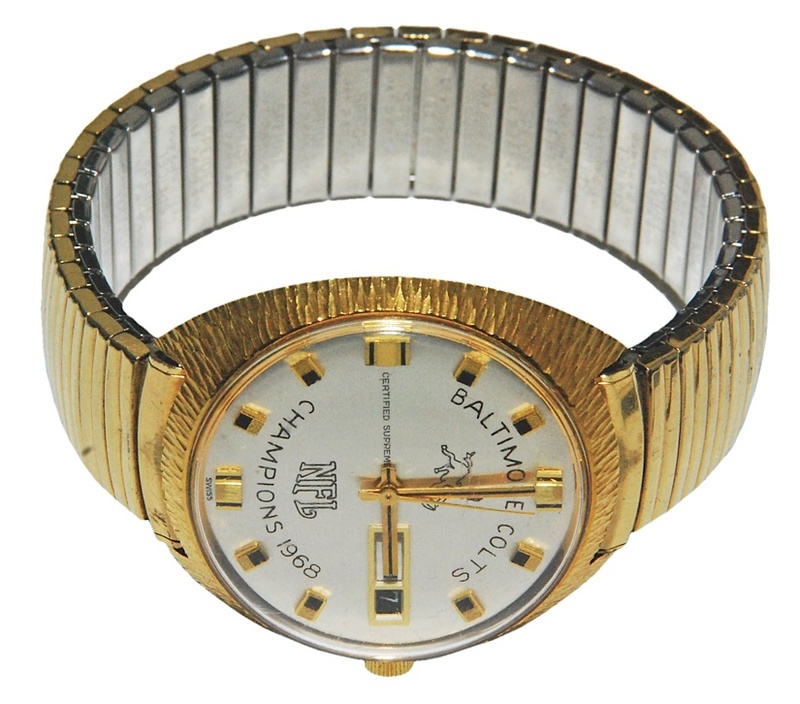 A team that was 3hrs away from being the greatest team in NFL history received THIS WATCH when they failed to win the game…wow! Think the NFL thought highly of their championship season? Now before you ask, the answer is yes the teams that lost Super Bowls I, II, and IV did receive rings. Let’s take you back to 1968…The Colts were motivated to win it all in 1968 because in 1967 they had the BEST record ever to NOT make the playoffs:11-1-2 including a win over the Packers who would go on to win Super Bowl II. The Rams had an identical record and won the tiebreaker for giving the Colts their one loss. The Colts were in the Western Conference and for the better part of the 60’s couldn’t unseat the Packers. Except in 1964 when Paul Hornung was suspended for gambling, yet the Colts were upset in Cleveland in the Championship game. Yes you heard me correctly…the Packers and Colts were in the WESTERN CONFERENCE back then. So Vince Lombardi steps down and the Packers run out of steam and the Colts go 13-1 in 1968. So in TWO seasons they had only lost 2 games going 24-2-2. No regular season overtime back then hence the two ties. Like other teams I’ve mentioned, this team that DIDNT win it all was the strongest Baltimore Colts team ever. They had a defense that set the league record for fewest points allowed in a 14 game season with 144 points. 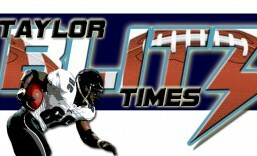 They held 11 of their 14 opponents to 10 pts or less including 3 shutouts. The great Johnny Unitas got hurt and Earl Morrall replaced him and became league MVP at quarterback. They had Tom Matte and Jerry Hill as arguably the best running tandem in football. Their only regular season loss in 1968 was to the Cleveland Browns who they would go on to blow out 34-0 in the NFL Championship game IN CLEVELAND. So with that it was as though they practically had an undefeated season and were lauded as the best team in NFL history. CHAPTER II: A vignette of what was shared by Bill Curry, Bubba Smith, Mike Curtis, and Ernie Accorsi as the events and aftermath of Super Bowl III were recounted in 2007. CHAPTER III/EPILOGUE: Again, what makes this unique are the events that take place hastening Don Shula’s departure, where he became the NFL’s All Time winning coach in Miami and not Baltimore. Even after winning Super Bowl V, Carroll Rosenbloom was still disenchanted with being the owner of the Baltimore Colts and swapped franchises with the Rams Robert Irsay in 1972. Was it ironic or a part of the story, that after winning Super Bowl V, the Baltimore Colts made it to the AFC Championship to defend their title?? Who did they lose to 21-0 to bring about the end of an era (1958-1971) where the Colts were among the NFL elite?? Don Shula and the Miami Dolphins in the Orange Bowl. Another irony is Don Shula went on to become the winningest coach in NFL history in the stadium where Super Bowl III was held. The Orange Bowl. Don Shula went on to exorcise his demons. As for Carroll Rosenbloom, Ernie Accorsi, Bubba Smith, Mike Curtis, and Bill Curry?? So remember to pay close attention to the men and these moments. What will become of the principles of a landmark event for those on both sides of the equation?? A compelling study in the psychology of man and sport. This is one of the reasons we love bringing you these real life stories with such richness. Thanks for reading and share this with those who love football and football history. Teach them something that scores on ESPN won’t tell them. One of the great things about the NFL and it’s history are the stories behind the men. Unfortunately the greatest lessons come from those that come up short in big games. Everyone loves a David v. Goliath scenario when the underdog pulls off an upset. When a landmark incident takes place like Super Bowl III, all eyes follow the winner who have vanquished a favored foe and the game is revered and talked about for years to come. Super Bowl III has been rehashed, talked about, re-shown, and re-released in 1997 (as a video broadcast) for a generation to see for themselves a landmark game that changed the course of the NFL. It was the centerpiece to a Hall of Fame career for Joe Namath and allowed Weeb Ewbank to become the only coach to win a championship in both leagues. Yet what does all this fallout do to the men who lost that event?? Is the harm irreparable for the men who came up short in Super Bowl III?? How easy is it to forget and move on?? Surely the Baltimore Colts could go on and win another championship and set things straight, right?? Here are the accounts of Bill Curry, Mike Curtis, and the late Bubba Smith. As you listen to the recount through their eyes, you will get a different feeling about Super Bowl III than ever before. What is ironic, these are interviews celebrating their Super Bowl V championship for the America’s Game series. What makes these poignant is the distinct sound of honesty reflected in their voices. What makes these stories resonate is this was a game 42 years ago and made even more impactful that this was the last interview for Bubba Smith to talk about this with his passing last week. CHAPTER II: A vignette of what was shared by Bill Curry, Bubba Smith, Mike Curtis, and Ernie Accorsi as the events and aftermath of Super Bowl III were recounted. Was it ironic or a part of the story, that after winning Super Bowl V, the Baltimore Colts made it to the AFC Championship to defend their title?? Who did they lose to 21-0, to bring about the end of an era (1958-1971) where the Colts were among the NFL elite?? Don Shula and the Miami Dolphins in the Orange Bowl. Another irony is Don Shula went on to become the winningest coach in NFL history in the stadium where Super Bowl III was held. The Orange Bowl. Don Shula went on to excorcise his demons. As for Carroll Rosenbloom, Ernie Accorsi, Bubba Smith, Mike Curtis, and Bill Curry?? So remember to pay close attention to the men and these moments. What will become of the principles of a landmark event for those on both sides of the equation. A compelling study in the psychology of man and sport. This is one of the reasons we love bringing you these real life stories with such richness.